Last year my wife and I spent a long weekend at Cape May to celebrate our 5th anniversary; this year, we couldn’t do awhile weekend but we wanted to continue the tradition. I wanted to get really early so that we could be there at sunrise; Shari wanted to get up just before sunrise and make it down there early-is in the morning. We compromised and did what she wanted. But it was a fun trip, even if we missed the early-morning light. We were going for birds, butterflies and odonata, and we found all 3. We started at Cape May Meadows, getting there in the early daylight, quickly finding a multitude of damselflies all over the grasses. Common Buckeyes were everywhere, even outnumbering the cabbage whites that flittered about. The birds were a bit more sparse than we had expected. A few geese, mallards and swans but none of the shorebirds we were hoping for. In the brush, numerous common yellowthroats sang their songs … “witchety-witchety-witchety-witch!”, but were more often heard than seen. We kept walking, reaching the beach, which revealed a few nesting least terns (none of which seemed particularly happy to see us. 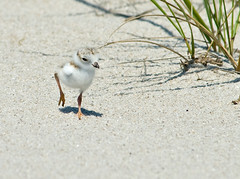 There was also a single piping plover, but no chicks anywhere. So back to the marshes we went. There, we ran into odonata heaven – hundreds of damselflies and dragonflies all over the place. The damselflies seeemed pretty intent on mating for as long as possible, and most of the dragonflies were hovering over them, defending their own territories. Common green darners, wandering and spot-winged gliders and black saddlebags were pretty common over the water by the observation tower. 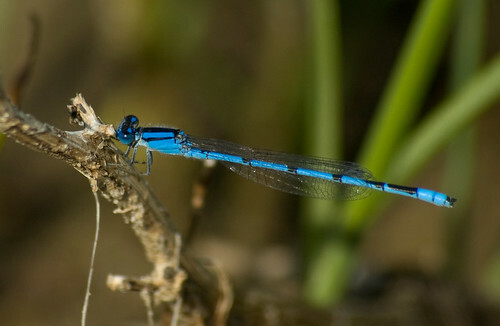 Familiar bluets and Rambur’s forktails were the most common damsels, with citrine forktails also plentiful. Walking toward the parking lot, we encountered a bonanza of dragons: Calico & Halloween pennants numbered in the dozens, as were Needham’s skimmers. Other species flittered in and out, usually too quickly to identify before they were gone back into the high grasses and wildflowers. Making the obligatory bathroom stop, we also paused to watch the many purple martins tending to their young, a few wayward house sparrows desegregating the martin houses for their own needs. After a short visit with the martins – the light was just a bit too harsh for good pictures of these dark birds’ ebony-violet iridescence against the gleaming white faux gourds – we moved to the other side of the parking lot and the hawk watch overlook. Things there were relatively quiet, though – nothing more than a few herons and lots of geese in the pond, so we decided to walk the boardwalk trails of the park for more interesting things to photograph. The park was full of life – most of it with 4 wings and six legs. 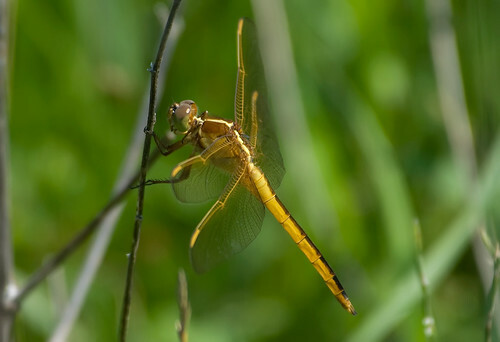 Sprites of one sort or another – I never got a good shot of one – joined familiar bluets, Rambur’s forktails and a multitude of different dragonfly species throughout the length of the short trail. But the most impressive site of all were the absolutely huge swamp darners, which were 4″ long if they were an inch. I’m prone to hyperbole at times, but there is no exaggerating the huge size of these dragons – they literally dwarfed the far less common Common Green Darners flying nearby. We even had a few take an interest in us, hovering around us with their own intense curiosity, and gave us good enough close-up looks to know that they were nearly the size of my hand (and I have big hands — which, as any person would tell you, means that I … wear big gloves). Beautiful dragons to see, they were even more impressive because there were an easy dozen of them mixed in with a swarm of spot-winged gliders hunting the grassy parts of the marsh. Closer to the water, black and red saddlebags hunted the low waters, competing with Needham’s and Painted skimmers amongst the reeds. Common green darners flew in and out of them, all but oblivious to their protests over an unseen territorial line, while great blue skimmers and blue dashers slid in under the radar for quick meals as they were distracted. In the distance a multitude of swans competed in a late round of faux-courtship maneuvers, while the single green heron flew over the pond to destinations unknown. After our little boardwalk trek, we decided that it was time to sit and have some lunch. We had decided to do a romantic finger-food lunch – prosciutto and sharp provolone cheese, honeydew, hummus and stuffed grape leaves, bruschetta and rosemary bread, tabouli and different fruits. It turned out to be just perfect – a mixture of cool and warm, salty and sweet, all blending perfectly to whet our appetite without being too filling or hard to manage sitting at a picnic table in the park. It was a really nice time, just sitting there talking, eating and looking around at whatever wildlife came our way. We didn’t rush, we just ate and enjoyed. When we were done both, we decided to head over to Higbee’s Beach for the next part of our trip. Last year, Higbee Beach proved to be a great place to visit in both June and July. It was hot both times, but there were birds, butterflies and dragonflies galore to see and photograph. This time … um, not so much. I got to see a few good dragonflies in the 20 minutes we were there, but whether it was the heat or just a bad year there, the creatures were not nearly out in the same numbers as our previous visit. One interesting note was one of the few butterflies I saw (in general, butterfly numbers were way down this year). 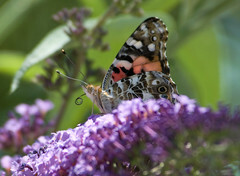 I took a shot of an admiral on a butterfly bush, and just assumed it was a red admiral without giving it too much thought. It wasn’t until after I posted it to Flickr that someone corrected my ID. It turns out that this was not a red admiral but a Painted Lady, a common butterfly that I had somehow never been able to find. Here I had gotten a decent shot of one and hadn’t realized it. Check up at least ONE lifelist entry! But after a short trip to Higbee, we wandered around a bit – stopping at the Cape May Bird Observatory and several other ‘hot spots’ around town – with little to show for it before heading back to the Meadows for round II – and I’m glad that we did. Our second visit of the day to Cape May Meadows (now officially called the “Cape May Migratory Bird Refuge) was even more fruitful than our earlier morning trip. The dragons were out in force, and a greater number of birds were out enjoying the nice weather – Forsters and common terns, laughing gulls by the dozens and at least 17 swans (yes, 17). 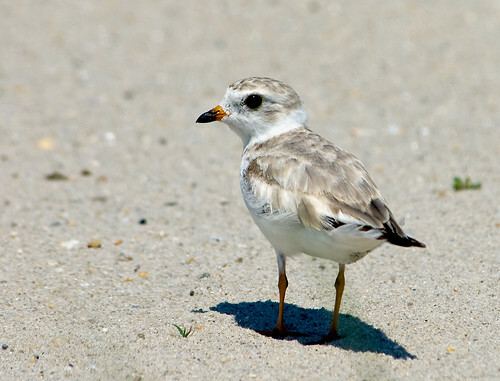 But as exciting as nearly a score of swans was, we decided to take another stab at the beach, even though the sun was pretty high – Shari had never seen a piping plover chick and we wanted to give her the chance. At first, it looked like we were going to be disappointed. Not only were the chicks nowhere to be seen, but the adults were missing, too. 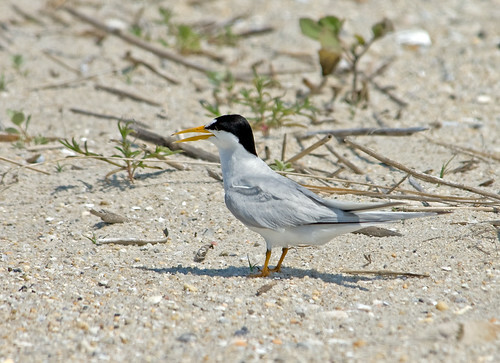 A couple of least terns were flying nearby but seemed ignorant or unimpressed by our presence. So, we started walking back up the path to the marshes when we saw them. 2 adults and 2 chicks who practically ran across our feet. They were literally less than a meter from us, crossing the walking path. Immediately the cameras came up and we tried to get some shots. The hot sand was making focusing difficult even at the short distances as the heat created a moire-like effect just above the top of the beach – unfortunately, the exact place that these little plovers and their even smaller chicks were taking up. We watched them get to a cautious distance, pipping their way across the hot sand away from us and then waiting to see what we’d do – which is sit down and try not to be threatening. It seemed to work for the most part – that is, until the chicks’ curiosity got the better of their intelligence and they decided to come closer for a better look. That seemed to set the parents’ warning radar off and a new round of pips and squeaks commenced. For our part, we stayed still and tried to NOT disturb them – I even laid in the sand to create a smaller profile, but the parents were not buying it, trying to corral their young ones away from that threatening spectre of photography, Shari. We watched as the chicks came closer and closer, parents trying to dissuade their insanity, and taking the pictures we could. Once again they chicks came within an arms length of us, only to run away in a game of chicken. The whole episode lasted for a good 5 minutes before we decided that the chicks and their parents had probably had enough excitement and decided to move on. But even that wasn’t easy, as the chicks decided that was the precise time they wanted to cross ‘the road’ right in front of us. We couldn’t win for losing! 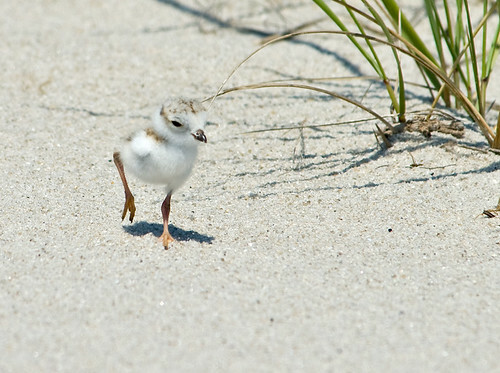 But it was an amazing experience for both Shari and I to see these little puffballs making their way in the harsh environment that is the Jersey shore. But the excitement wasn’t over yet. As we crested the dune, I spied a dragonfly hovering next to the hedgerow. I figured out that it was a spot-winged glider breaking the first of the two of the absolute rules I had revealed to Shari only hours earlier – that they never stay still long enough for a picture. But this one was doing more than that – he hovered in place for at least 5 minutes (or at least within a few inches of the same spot). We took over 100 pictures each, and managed to get some pretty exciting flight shots. 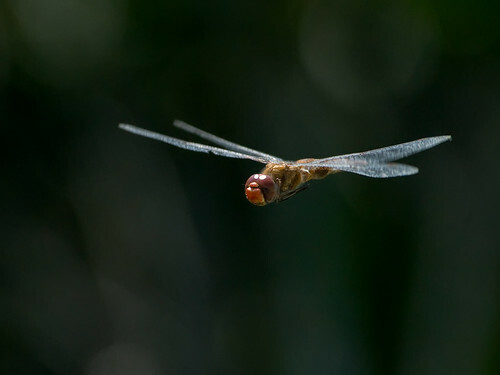 It turns out (after reviewing my pictures from the day), that I also managed to get that other perennially-tough to photograph species, the wandering glider, as well, so I had a good day of dragonfly photography. Normally, Shari isn’t as into the dragonflies, but this courteous specimen really got her attention – more than just being a cool dragon, it allowed her to test out the settings on her D3 and try a variety of combinations of shutter speed, aperture, exposure compensation and other settings. The result was a pretty cool shot of a very cool dragonfly (see more of Shari’s pictures, too). But our day wasn’t over – we still had to break Rule #2 about the gliders – that they never land for a picture. Luckily, that only took a few minutes more. As we came to the pond by the observation tower, the damsels and dragons were still plentiful and active. But I spied one in particular hanging on a small reed by the edge of the shore. I swooped in to get a shot of this cool dragon, thinking it was a baskettail of some sort. It wasn’t until I got home later that I realized it was yet another spot-winged glider … perched!! 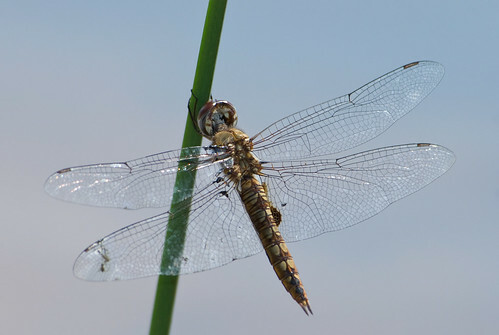 Dragonflies: Blue Dasher, Common Green Darner, Swamp Darner, Eastern Amberwing, Eastern Pondhawk, Calico Pennant, Four-spotted Pennant, Halloween Pennant, Great Blue Skimmer, Needham’s Skimmer, Painted Skimmer, Spot-winged Glider, Wandering Glider, Black Saddlebags, Red Saddlebags, Meadowhawk sp. gracias – it was a really fun day, and a rare one in that Shari and I both had a decent number of shots we liked (usually one or the other gets the decent shots for the day). You killed me with the “we compromised and did it her way” part. Happy belated anniversary!